Petasites growing leaf plant rhizome of the genus Petasites also known as Butterburs, Petasites perennial deciduous plant also used as ornamental ground cover plant and medical plant, can grow in temperate, mediterranean or subtropical climate also as houseplant and growing in hardiness zone 5-10. Leaves color green or variegate green and yellow in heart shape grow on stems. Flower color white, yellow, pink, purple or mostly mix colors, small star shape that create ball. 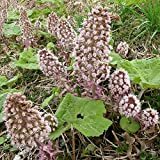 Petasites japonicus Giganteus DINOSAUR FOOD Seeds! Petasites albus HUGE LEAVES Perennial Seeds!